The deadline for article submissions to ESSE Messenger’s Winter 2017 issue, having the topic Jane Austen Ours, has been extended to 29 October 2017. Now the ESSE Messenger has its own Twitter Page: @EsseMessenger. The Winter issue – 25-2 Winter 2016 – of the Messenger is now online. You can find it here: http://essenglish.org/messenger/web/issue-25-2-winter-2016/. The password to access it can be obtained from your national representative. The Winter 2016 issue of the Messenger is to be published soon. The Messenger’s next issue – 25-2, Winter 2016 – is due out in December 2016. The suggested topic for professional articles is Shakespeare Lives. 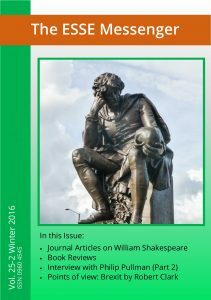 In the year when scholars and students, writers and artists celebrate the 400th anniversary of the playwright’s death, the ESSE Messenger Winter 2016 issue is again dedicated to the great Bard and invites contributions about how Shakespeare is still connected with the modern world: how he is re-discovered and made part of our lives, how he is played, taught, interpreted, translated, sung, filmed, etc. in the world of today. The information for advertisers in the website of The ESSE Messenger is now online on the Advertisers page of the site. The ESSE Messenger is now online. It will continue the good tradition of the printed version and host messages from the ESSE President, other members of the ESSE Executive or the Editor, offer current information, notes and details about events, conferences, book launches, in memoriam notes, and publish book reviews, (themed) articles, interviews, original literature. The Editor’s aim, hope and efforts are to offer a publication of good quality that readers appreciate, find useful and enjoy reading. Contributors are invited to observe the Editorial Code, format their materials according to the Messenger’s Stylesheet and send them to the Editor at: esse.messenger.outlook.com.